All of us at the Wildlife Investigations Lab would like to wish you and your family a safe and happy Halloween! 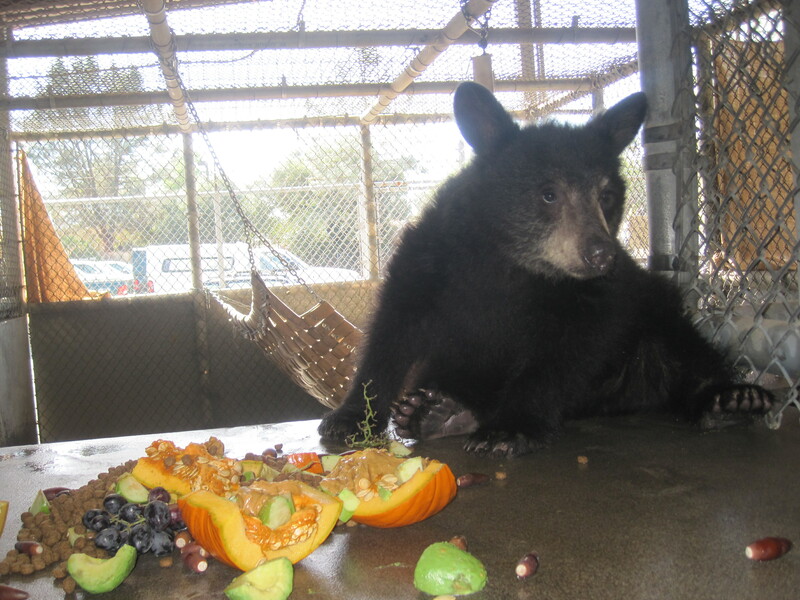 Do you recognize this little bear cub enjoying a Halloween treat? It may be difficult considering she has a beautiful, thick coat of hair growing in! Click here to read about her amazing recovery. Fawn showing signs of hair loss. 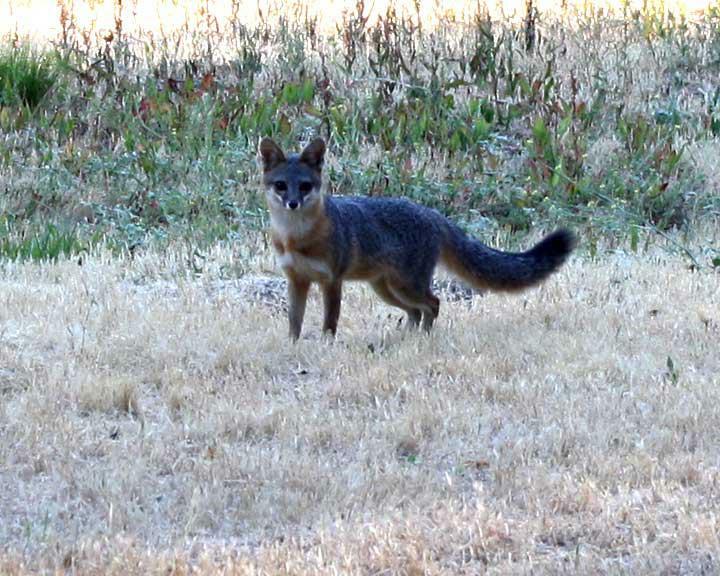 Photo taken by DFG Biologist David Lancaster, Humboldt County. A deer Hair Loss Syndrome (HLS) workshop was hosted by the Wildlife Investigations Lab on Aug. 20-21, 2012. Most of the state’s leading researchers on HLS participated, including 17 wildlife veterinarians, epidemiologists, graduate students, veterinary pathologists and DFG environmental scientists. Participants reviewed current knowledge and status of research, identified priority research needs, and explored feasible management actions to mitigate the effects of HLS. HLS is a recently described disorder affecting black-tailed deer in the coastal areas of Washington, Oregon and California. Little is known about the cause of the syndrome and its effect on black-tailed deer populations. It is characterized by a severe infestation of an exotic chewing louse (Damalinia sp. ), general decline in body condition, hair loss (especially over the thorax, flanks and hindquarters), morbidity, mortality and excessive grooming behavior. It is seen in mostly young deer, especially does, and is most evident in the winter and spring. In 2009 another exotic louse species, Bovicola tibialis, was identified in California mule deer in Tuolumne County, causing a similar hair loss syndrome. Fallow deer are the natural host for B. tibialis. How this exotic louse species adapted to native deer is unknown. Dr. Pamela Swift, WIL wildlife veterinarian specializing in deer health, is the lead investigator of a HLS study, Statewide Assessment of Disease and Environmental Factors Affecting Deer Herd Population Demographics and Health, in which heavy metals (e.g., copper and selenium) in the deer are studied and compared to the presence of the exotic louse, and the presence of clinical hair loss. Samples collected from deer in the study are also analyzed and tested for a disease agent which could cause the suppression of the immune system leading to a severe infestation of lice. A few weeks ago we published a blog post about the rescuing of a doe wrapped in a tomato cage and how it was a prime example of human-wildlife conflict. Sure enough, it wasn’t long before the DFG North Central Region personnel and WIL were called upon again to help another deer residing close to human residences. A mule deer buck, complete with hammock. 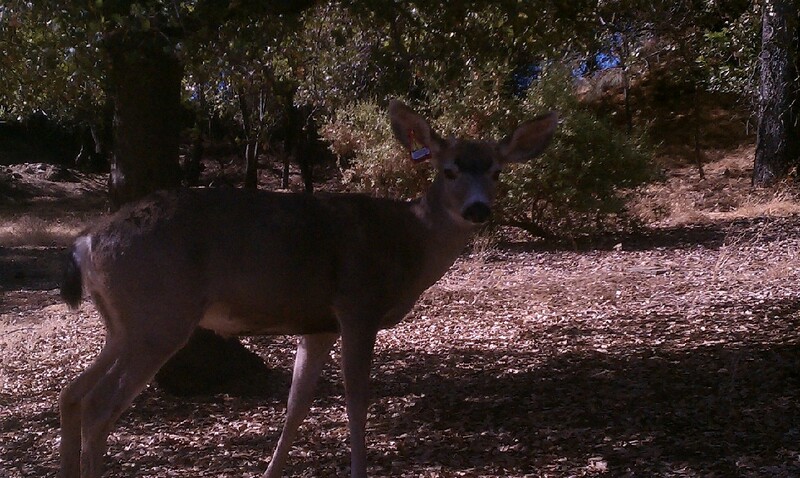 A concerned citizen located near El Dorado Hills reached out to Fish and Game through email. He told us of a local buck that had a hammock enveloping his left antler, causing the buck to use up energy in a hopeless attempt at removing it on his own. A team was sent out to assess the situation and determine the most appropriate action to take. North Central Region staff Ed Andrews, Shelly Blair, and WIL Scientific Aid David Mollel monitor the deer as they prepare to administer the reversal agent. 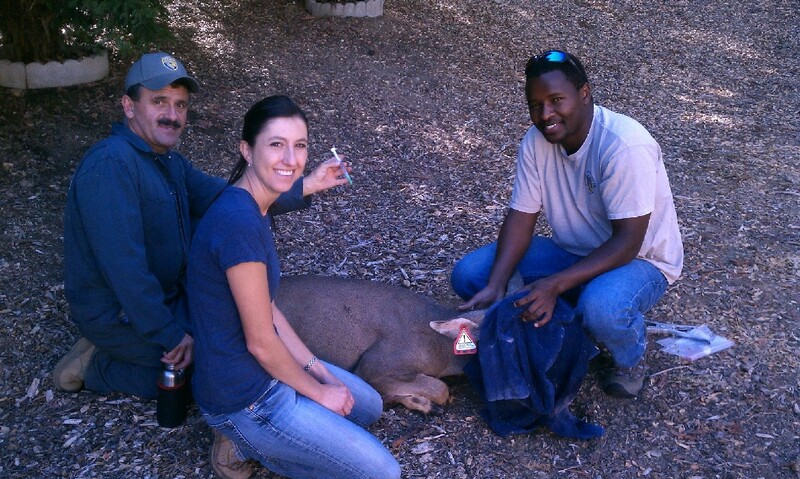 Given the circumstances –a suburban environment and an unapproachable deer – WIL veterinarian Dr. Ben Gonzales and North Central Region Senior Environmental Scientist Jason Holley felt it was best to chemically immobilize the buck using a dart projector, much like the last rescue involving the doe and the wire. The buck was successfully darted, and chemical immobilization protocol was followed. It was decided that the best solution for this particular buck was to remove the antlers completely, relieving him of the attached hammock in the process. The benefits of removing the antlers include the quick removal process, limitation of stress on the animal, and prevention of re-entanglement. The buck walking off post-capture, feeling a little lighter. Ultimately this may cost the buck a chance at breeding this mating season. Antlers are used to compete directly with other males through both fighting and display. Does are more likely to choose mates that are dominant and exhibit quality antlers. However, antlers are shed once the breeding season is complete – anywhere from mid-January to mid-April. The playing field will be level again, and this buck will be able to grow a new quality spread, free of the hammock ornament. Plus, this deer is unlikely to become the target of any hunters looking for a new trophy this season. Thanks to vigilance from the general public, the Department of Fish and Game is able to respond to wildlife issues that may otherwise go unnoticed. Wildlife is abundant in California, and human-wildlife conflicts will continue to occur. At times it can be a bit unclear who you should contact in case you come across nuisance, dangerous, or injured wildlife. Local cases are typically handled by regional offices. Contact information can be found here. DFG also provides plenty of information on living with wildlife here. Special thanks to North Central Region staff Jason Holley, Shelly Blair, Ed Andrews, and WIL staff Dr. Ben Gonzales and David Mollel for their hard work and dedication! 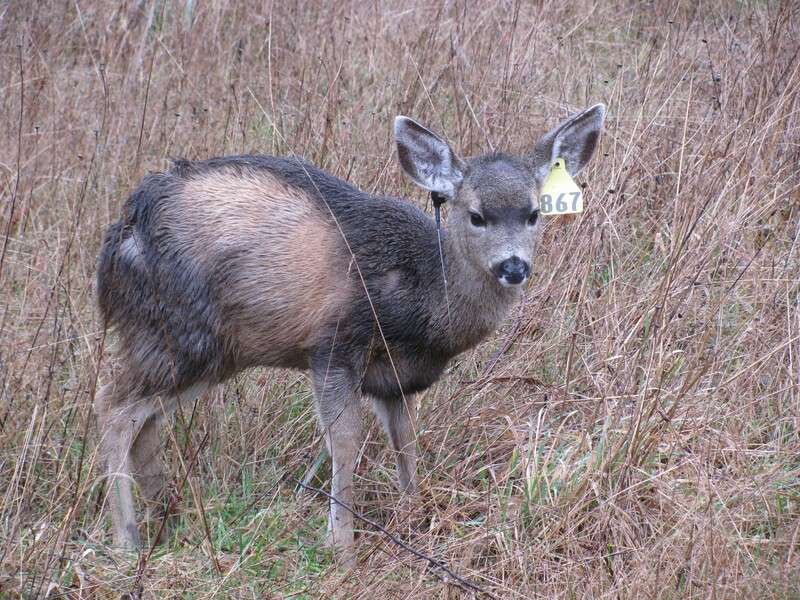 An unidentified parasite was recently found in Humboldt County in a black-tailed deer lung. A hunter-harvested deer was discovered to have a multitude of small fluid-filled cysts scattered throughout the lung tissue. It’s suspected to be the intermediate stage of a tapeworm, known as “cysticercosis”, but this is uncertain since Dr. Pam Swift (Wildlife Investigations Lab ) and Dr. Leslie Woods (California Animal Health and Food Safety Lab, UC Davis) have not seen this pathology before. A sample was submitted to the UC Davis lab and the National Veterinary Services Laboratory in Ames, Iowa, for identification. Results will take up to 30 days. Deer can ingest the tapeworm eggs while grazing. Upon hatching, the tapeworm larvae migrate to various tissues and form cysts. 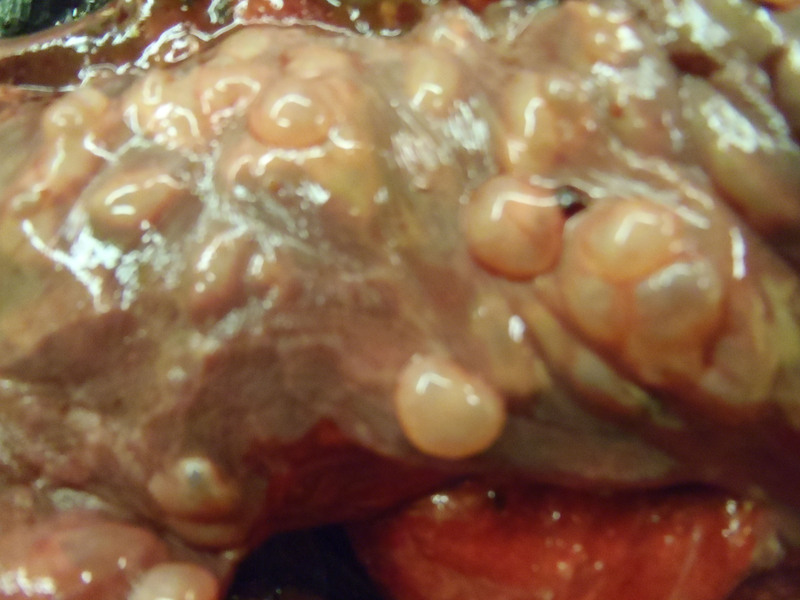 Here the cysts remain until the deer is consumed by a carnivore. The cysts eventually develop into an adult tapeworm in the carnivore. The hunter was contacted by the Department of Fish and Game biologist for Humboldt County and instructed not to consume the meat. Beauty is in the Eye of the Beholder: A Story About a Little Bear that Could. In July, Fish and Game responded to a call from a homeowner in San Luis Obispo who reported something was in the backyard. When game wardens arrived, they found a young black bear cub with a very unusual problem – she had no hair. Week 5. Posing candidly while patiently waiting for her morning meal. After determining that the cub appeared orphaned, Fish and Game officials captured the cub and transported her to the Wildlife Investigations Lab (WIL) where she was examined by veterinarians Ben Gonzales and Deana Clifford. The cub was about six months old, 20 pounds underweight, dehydrated and she had a severe skin infection. Diagnostic tests were run including a complete blood panel, skin scraping, fungal culture and intestinal parasite exam. Her blood results were typical of a malnourished, dehydrated young animal with a compromised immune system. Her culture grew a fungus and microscopic examination of the fungus identified the culprit as Trichophyton mentagrophytes – ringworm, a highly contagious and zoonotic (meaning, it can be transmitted from animals to humans) disease. Skin scraping results also revealed the bear cub was heavily infested with Ursicoptes sp., a mange mite known to infect bears. Mange, also known as scabies, is a skin disease caused by a microscopic mite that parasitizes the top layer of skin. Depending on the species of mite, mange can be highly contagious between mammals, and sometimes from mammals to people. As far as we know, Ursicoptes sp. is not zoonotic. As the mites burrow into the skin, they cause an allergic reaction which leads to crusting of the skin and intense itching. Severe infections cause hair loss (alopecia), thickening and scabbing of the skin. Secondary fungal and bacterial infections commonly occur, which cause deep and superficial pyoderma (skin infection), leading to further degradation of the skin, the body’s first defense against disease. Mange has been reported in numerous wildlife species and it can also afflict domestic animals and humans. Animals that are severely infested typically show signs of poor health. While spontaneous recovery can occur, this disease can be fatal as the infection progresses. In the past few years, wildlife biologists have observed a rise in mange cases affecting local wildlife populations. Bighorn sheep, bobcats, mountain lions, foxes, coyotes, squirrels, and bears are a few of our valuable species that are vulnerable to mange mites. Our veterinarians had a big decision to make. If we treated this little bear, she would not be a good candidate for rehabilitation and eventual release. It can take animals with infections this severe many months to regrow all their hair. Intensive treatment and care would be required over a long period of time, during which time she could become habituated human caretakers. 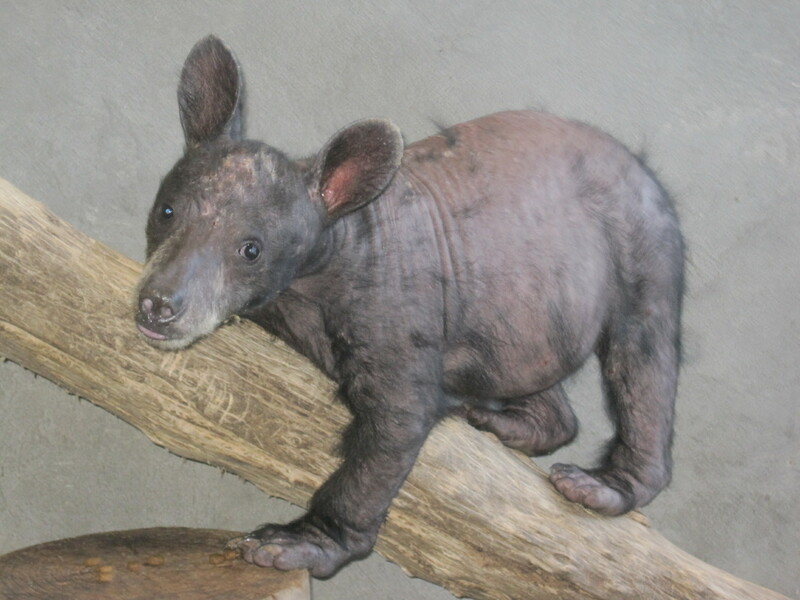 Also, both mange and ringworm are contagious to other bears, so she could not be housed with other cubs for company. However, if we decided not to treat her and release her back into the wild, her chances of survival were extremely poor – especially with the coming winter. After careful consideration, WIL veterinarians decided the best course of action was to treat the cub until we could transfer her to an approved zoo. Because this little cub had been sick for so long, her natural defenses to ward off disease and infection were shut down. So, how would WIL go about treating such a heavily parasitized little bear? There is limited literature about how to successfully treat wild black bears with infections this severe. We knew we had to treat her parasite, fungus and bacterial infections all at the same time. She was given an antibiotic for her bacterial skin infections that was specially made to be peanut butter-flavored. She was also given an injection for the mites but her systemic treatment for the ringworm infection was postponed for a week due to potential side effects that could result because of her poor overall health. She was bathed using a specially medicated shampoo to clean and soothe her skin and dipped in lime-sulfur – a treatment that would help kill both the parasitic mites and the ringworm. Subcutaneous fluids were given to boost her hydration. Each week, the cub would need to receive a bath and a dip as well as an anti-parasitic injection (which should be given for up to 6 weeks). Twice a day she would receive an antibiotic for her bacterial skin infections and once she was healthy enough, she would require twice daily antifungal medication. Not to mention round-the-clock care and feedings until she could maintain a healthy body weight … and the WIL staffers all signed up! Week 4. How do you go about giving a bear oral medication? Hide it in a grape of course! Luckily for us, this little bear loves grapes and happily eats them – even if they have pills hidden inside! Here, she is displaying her great balance after eating her evening meal and medication. After 3 months of intensive care; this cub has tripled in size and is starting to develop a fine coat of new hair. Her blood chemistry has improved and for the past three weeks tests have detectged no mites. She has made giant leaps toward recovery and is doing well on systemic antifungal treatment. Her fungal culture has not had any growth for more than a week. She will continue to be treated until we are confident her infection has resolved and she has completed the medication regimen. It will be months, possibly more than a year, before she has a complete hair coat but to us she is a beautiful baby bear. So what will become of the little bear? When we feel confident she is not contagious and is healthy enough for travel, she will be transported to her new home at the Gladys Porter Zoo in Brownsville, Texas, where the bear keepers are anxiously awaiting her arrival. Week 8. Starting to look like a bear! 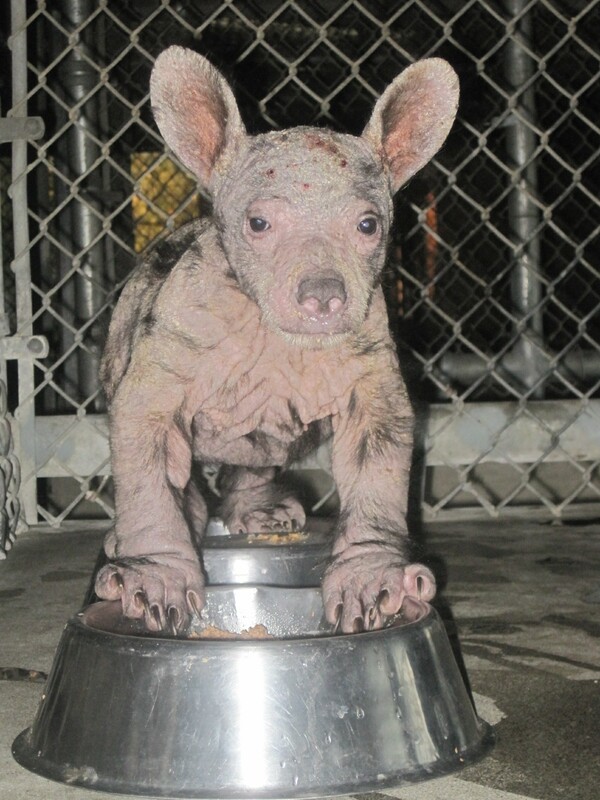 A hairless bear poses many challenges. One such problem is her inability to thermoregulate normally. While Sacramento summer days are nice and warm, it can be cold at night. Here at WIL, our bear dens have specially heated floors. Pair that with a cozy crate and wool blankets, then you have a safe, warm haven for a hairless bear! In this photo, she awaits a cool treat-a homemade popsicle of water and fresh fruit pieces! 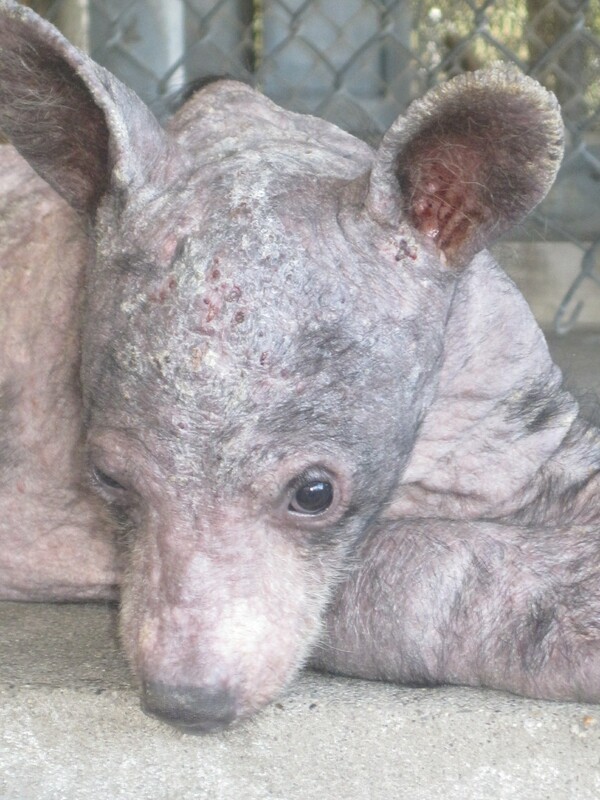 The decision to treat this little bear has contributed to our understanding of mange and ringworm in bear cubs. At WIL, it is our hope that what we have learned will lead us and others to better understand the impact of mange and related diseases and contribute to more effective treatment of future cases. Special thanks to the WIL staff and volunteers who have given this little bear extraordinary care. Also thank you to Dr. Larry Buntrock and the staff at San Juan Veterinary Hospital in Citrus Heights for donating medications to the lab, Douglas Feed and Pet Supply, and to Raley’s for donating produce – especially those grapes she loves so much! 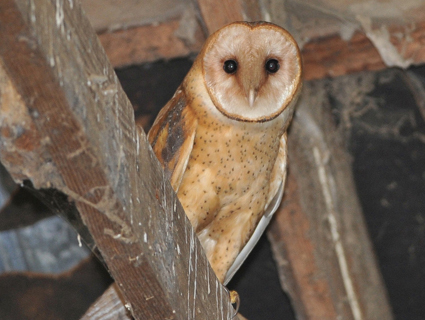 Barn owls are common victims of secondary exposure of anticoagulant rodenticides. Photo Credit: Cornell Lab of Ornithology. Most of the pesticide-related wildlife problems I deal with currently involve rodenticides. It is not hard to see why – a material that is toxic to rodents is generally toxic to other vertebrates. Yet, rodents cause a great deal of damage to agriculture and they are household pests, and so the need for rodent control is real. While we can recommend non-chemical measures be used whenever possible, we also need to be realistic about the continued use of rodenticides so we can continue to play a part in the regulation of these products. Anticoagulant rodenticides have been the focus of attention lately for good reason. Several recent studies have shown widespread exposure among predators and scavengers to anticoagulant rodenticides. Here at the Wildlife Investigations Laboratory, we have received a few hundred carcasses of wildlife that have been killed as a result of these materials, including San Joaquin kit foxes, mountain lions, bobcats, coyotes, red foxes, gray foxes, black bears, kangaroo rats, golden eagles, great horned owls, barn owls, turkey vultures, Cooper’s hawks, red-shouldered hawks, red-tailed hawks, American kestrels, wild turkeys and Canada geese. The U.S. Environmental Protection Agency and the California Department of Pesticide Regulation are working on regulatory solutions to decrease unintended impacts associated with anticoagulant rodenticide issue. Regulation is certainly a step in the right direction. However, regulation of one pesticide often increases the use of another pesticide with a similar function. And so, as rodenticide use evolves, we must remain vigilant in our protection of wildlife. One rodenticide I’m keeping my eye on is strychnine. In California, we went nearly a decade without any reported cases of wildlife poisoned by strychnine. Now, in the last couple of years, we’ve had several. So, what’s going on? Is it just coincidence or is it due to the increased regulation of anticoagulant rodenticides? This is a good example of why education about proper use practices is so important. Certainly some pesticides are more likely than others to cause problems, including those that are extremely toxic, not selective or persistent. But even the more environmental friendly pesticides can cause problems if they aren’t used properly. So we keep our eyes open and keep working together to protect wildlife.